(From Canon lens literature) Having the right tool for the job has long been the mantra for professional photographers and hobbyists alike. Canon's wide array of lenses provide users with a variety of creative options to help capture dynamic photos and videos with their DSLR cameras. Canon U.S.A., Inc., a leader in digital imaging solutions, has announced the new Canon EF 70-300mm f/4-5.6 IS II USM lens featuring NANO USM technology for high-speed and near-silent focusing in both still and video modes. The lens also features a new LCD information display and four-stop* image stabilization. "To help photographers that are striving to create the most amazing pictures and videos possible, Canon is dedicated to developing the best tools to help them with their goal," said Yuichi Ishizuka, president and COO, Canon U.S.A., Inc. "Having this new EF 70-300mm f/4-5.6 IS II USM lens in a photographer's camera bag will surely help them achieve their creative vision." Designed with the user in mind, this affordable new lens includes technology to spark creativity and deliver excellent image and video quality from afar. This is the second Canon lens equipped with NANO USM technology, a focusing motor that combines the benefits of a ring USM (ultrasonic motor) for high-speed AF during still photo shooting and lead-screw type STM (stepping motor) for smooth and quiet video autofocusing (AF). The Canon EF 70-300mm f/4-5.6 IS II USM lens is scheduled to be available in November 2016, for an estimated retail price of $549.99**. 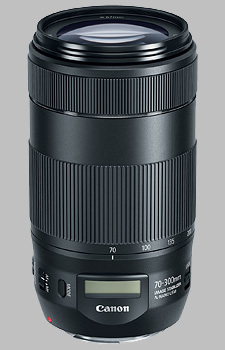 The Canon EF 70-300mm f/4-5.6 IS II USM doesn't have any user reviews yet!